If you haven’t seen our part one coverage of our 2011 Chevrolet test drive at the 2011 Denver Auto Show, then be sure to check that out (more here). After talking a little about how the car drives, we thought it would be good to give people who haven’t had a chance to get in one an idea of the view from the inside out—especially when you have a backseat full of passengers and someone who is 6’ 2” 275 pounds. So what is it like, let’s check it out. If you haven’t actually sat in the 2011 Chevrolet Volt, then the best comparison we could make is to reference any of the Toyota Prius models. Like the Prius or the Honda Insight, the vision out the back can be limited due to the split bar in the back window. In fact, it is also a lot like the Pontiac Aztek. That said, for reversing purposes there is a rear view camera and the side mirrors are well positioned and a good size. 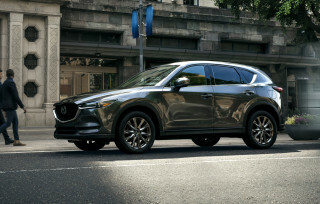 In general the view out the back takes a little getting used to, but it isn’t anything that should make the car unpleasant to drive even though your height will play a role in where that rear bar falls in your line-of-sight. 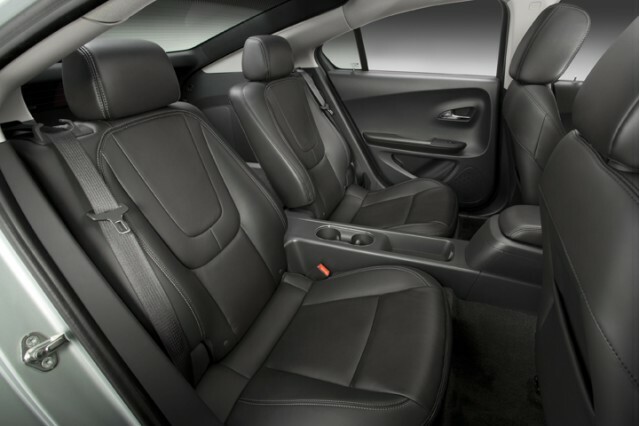 The view out of the 2011 Chevrolet Volt aside, the inside of the car is well put together. There are a couple difference from other Chevrolet family vehicles like the Chevrolet Cruze. The rear seat is missing something you might expect from a car the size of the Volt—the 5th passenger seat. Instead of the middle seat there is a console with two cup holders and there is a good reason for this. The T-style battery comes up the middle of the car, similar to the way a transmission would from a mid-engine sports car. 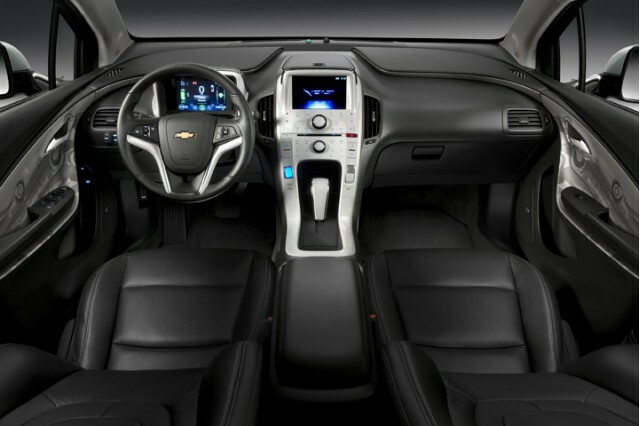 Since the battery is sitting between the seats, Chevrolet engineers needed to make the Volt a four passenger car as opposed to a five passenger. This might be a point of differentiation when comparing the Volt to other electrified vehicles like the Nissan LEAF, Toyota Plug-in Hybrid and Ford Focus Electric. Speaking of the backseat, how did our 6’ 2” passenger fare? Actually, it was better than any of us expected. The rear seat room compared to the Cruze isn’t as spacious, but tolerable even with a tall driver and an average male adult directly behind. Taller passengers will need to sit behind the front passenger and make sure they can pull the seat up enough to be comfortable. The rear seat headroom is also a little sparse due to the roofline (a compromise for a low drag coefficient). All in all though, our passenger it was more comfortable than they expected, but less so than the Cruze. The front seat, for those lucky enough to be driving, is supportive and had a good seat angle and driving position for this reporter. The gauges are also well defined an easy to read. It is easy to navigate the different functions with the dial to the left of the steering wheel on the dash. The one thing that is kind of interesting for those who drove or grew up in the ‘80s is that the gauge behind the steering wheel is a rectangle; it is a shape an size that reminds me of digital gauge clusters and instrument designs from other GM cars…perhaps Spaceship Camero. Bottom line—the 2011 Chevrolet Volt is not a luxury ride, but it is a great piece of automotive ingenuity that will help develop the acceptance of the electric vehicle by creating a driving experience that is similar to other new Chevrolet vehicles you might be looking to buy; the big difference is that the Volt helps reduce tailpipe emissions and can reduce your gasoline expenditures. Is there an auto show coming to your area in the near future? Make sure you check to see if there is a ride and drive program from Chevrolet coming because you might just get your chance to experience the Volt like we did at the 2011 Denver Auto Show. Miss the first part of our two part series? Check it out here. Also, be sure to pa-ruse the entire AllSmallCars.com 2011 Denver Auto Show coverage here. Need updates in a hurry? Be sure to check us out on Twitter via @allsmallcars.